Pre-activated NHS resin functionalized on a modern, high flow agarose base matrix for simplified ligand immobilization and fully customizable affinity chromatography purification resins. To support in the development and manufacture of biopharmaceuticals, Purolite has developed a range of pre-activated agarose resins. These resins enable manufacturers to couple their own ligands to develop affinity chromatography solutions. NHS, Epoxy and CNBr pre-activated chemistries are available in three particle sizes - 45 μm, 65 μm and 90 μm. 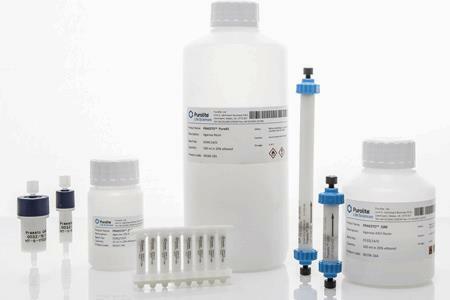 Praesto NHS resins have been designed to offer a simple solution for the immobilization of ligands onto an agarose chromatography matrix, which can be utilized to make customized affinity resins This enables rapid scale-up from R&D proof of concept to larger scale bioprocess production columns. Praesto NHS resins couple ligands which have a primary amine. Praesto NHS incorporates a spacer chain which separates the ligand from the chromatography matrix enabling maximum accessibility to the ligand. The pre-activated NHS resin forms a stable amide linkage between the matrix and ligand resulting in very low ligand leakage and high caustic stability. A common application for NHS resins is immobilization of antibodies to create immunosorbents. Coupling is via primary amino groups. Many well documented references are publicly available.